This is the third in the series of four blogs that I’m writing on the “Big Data MBA.” My first blog, “Big Data MBA: Course 101A,” covered the use of the “Big Data Worksheet” as a business valuation technique to help your line of business (LOB) users envision where and how big data analytics can impact them. I covered the types of questions they can ask and the types of decisions they can make. My second blog, “Big Data MBA: Course 101A – Unit II,” introduced Michael Porter’s Five Forces Analysis as a way to help organizations identify where and how they could deploy big data for market or industry changing impact. My third blog in the series will introduce Michael Porter’s more familiar Value Chain Analysis as another business valuation technique for identifying where and how big data can impact an organization’s internal operations. 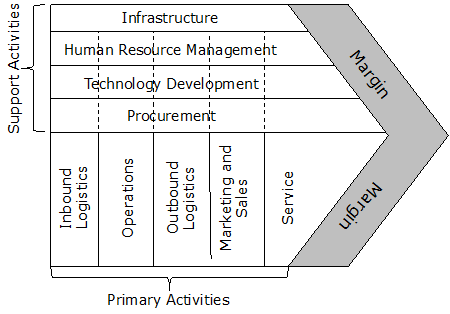 The Value Chain Analysis covers two categories of activities – primary and support activities. The primary activities are probably the most familiar, as it deals with the steps and processes necessary to take a product or service from its raw materials to final customer sale and support. Inbound Logistics – covers the identification, sourcing, procurement, and supplier management of the “raw materials” that comprise the final product or service. Operations – covers the engineering, inventory management, and manufacturing of the final product or service. Note: any technologies incorporated into the product or service are also included here. Outbound Logistics – covers the logistics and distribution of the final product and service. Marketing and Sales – covers the marketing, merchandising, promotions, advertising, sales, and channel management to get the completed product and service to the end customer. Service – covers the support and maintenance of products and services after they are delivered to the customer. The secondary activities are less familiar, but equally important in supporting product and service scalability. Technology Development – covers the supporting technologies, both information technologies as well as other technologies, important for keeping the lights on. Technologies integrated into the product would be covered in the Operations stage. Human Resource Management – covers the recruiting, hiring, development,and firing of personnel. Let’s again say that you are in the on-line retail business and are looking at how we can leverage big data analytics to improve internal processes that power our “optimize merchandising effectiveness” business initiative. Let’s use the Value Chain technique to understand how to apply big data analytics. You can see some further examples of applying big data analytics valuation to the Value Chain Support Activities in Figure 2. The Porter Value Chain Analysis provides a business-centric approach to looking at how big data analytics could potentially impact your organization’s internal value chain, or its internal value creation process. My next blog will wrap up this series by looking at the power of combining both the Value Chain Analysis and the Five Forces Analysis into the same business valuation exercise. Until then, continue reading your Michael Porter books! !